Why Do I Need To Pay For ODBC, JDBC, ADO.NET, OLE-DB Drivers? DataSpaces Bulletin: December issue now online! What Problem Does Natural Language Search Solve? 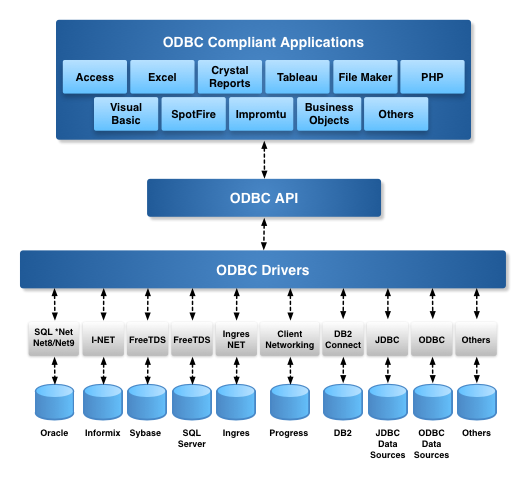 Today, we've updated the Lite Edition ODBC Driver for Oracle. Installation and configuration takes only minutes, by following the documentation which remains available anytime, specifically for this driver on Windows. Release 7.0 licenses are also available for immediate purchase. Release 7.0 installers are available for immediate download for Windows. Builds for Mac, Linux, and other Unix-like OS will be available soon; please contact us if you have urgent need. Today, we've updated the Express Edition ODBC Driver for Oracle. Installation and configuration takes only minutes, by following the documentation which remains available anytime, specifically for this driver on OS X and Windows. In coming months, we'll be gradually shipping Release 7.0 of all our UDA drivers. This post will be the first of many, describing some of the fixes, changes, and improvements in each driver as they are made available. Today, we have the Lite Edition ODBC Drivers for Sybase and Microsoft SQL Server. Release 7.0 installers are available for immediate download for Mac and Windows. Builds for Linux and other Unix-like OS will be available soon; please contact us if you have urgent need. wildcard query will return only col2 and col3; will not include SPARSE columns. This is standard SQL Server behavior, and it cannot be changed. open connection with SHOWSPARSECOLS in DSN connection string, e.g., "DSN=TdsSQL;UID=sa;PWD=sa;SHOWSPARSECOLS=Y;"
It's the year 2015, and the fundamental issues associated with the utility of data access drivers remain confusing. 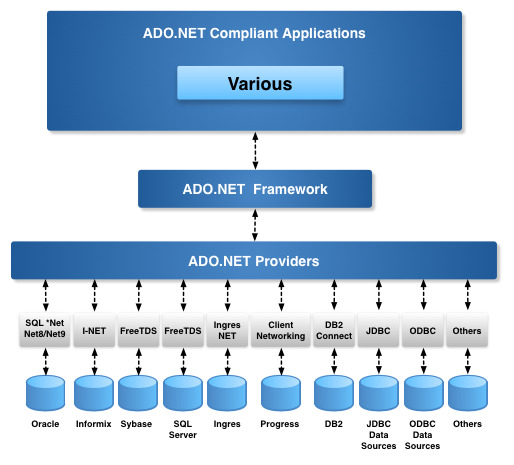 Basically, we remain uncertain about the value-to-compensation alignment of ODBC (Open Database Connectivity), JDBC (Java Database Connectivity), and ADO.NET drivers/providers. Why do we pay for anything? After allowing for consumer irrationality , the basis of any payment is fundamentally tied to the monetization of opportunity costs. Essentially, we pay for one thing to alleviate the (usually higher) costs of something else. The rest of this post focuses on highlighting the real pains associated with the $0.00 value misconception associated with Data Access Drivers: ODBC, JDBC, ADO.NET, OLE-DB, etc. Scrollable Cursors -- this is how you deal with change sensitivity and paging through large datasets; some drivers actually fake support and get away with it due to shortage of applications to test proper cursor types (Static, Forward-Only, Key-Set, Dynamic, and Mixed models). Any combination of the above as part of a configurable collection of data access rules (or policies). Once you've dealt with Security and Data Flow, you then have to address the enforcement of these settings across a myriad of ODBC compliant host, which is where Zeroconfig and centralized data access administration comes into play i.e., configure once (locally) and enforce globally. When OpenLink Software entered the ODBC Driver Market segment (circa 1992), the issues above were the fundamental basis of our Multi-Tier Drivers. Although the marketplace highlighted our drivers for high performance, stability, and specification adherence -- to all of which we remain committed -- our fundamental engineering focus has always been skewed towards configurable data security, platform independence, and scalability. Every item of concern outlined in the section above is addressed by security features built into our Multi-Tier Drivers . These features all leverage the fact that our multi-tier drivers include a sophisticated DB session rules book that enables construction and enforcement of user attribute (user name, application, client operating system, IP address, target database etc.) based rules which are applied to all database sessions (single or pooled). Today, in the year 2015, the security issues that pervade Data Access, whether via Native SQL RDBMS Drivers, or ODBC, JDBC, and ADO.NET Drivers/Providers, have only increased, courtesy of ubiquitous computing -- facilitated by the Internet & Web, across desktop and mobile device dimensions. Paradoxically, there remains a fundamental illusion that all Data Access Drivers are made the same; i.e., they simply provide you with the ability to connect to SQL RDBMS back-ends, for the industry standard price of $0.00, without consequence -- thereby skewing the very nature of SQL RDBMS data access and its security and privacy implications. I hope that this post brings some clarity to a very serious security and general configuration management issues associated with Data Access Drivers. Free ODBC Drivers offer nothing; that's why they cost $0.00. When dealing with real issues associated with Open Data Access, you must have a handle on the inevitable issues of data security and privacy. When Sun originally released Java 1.0, there were no JDBC drivers -- there wasn't even a JDBC. Data access came in Java 2.0, as JDBC 1.0, but there were very few JDBC drivers from any source, as would be expected with any new technology -- but the ODBC ecosystem (itself then at only v2.0) was going strong. Sun recognized that Java wouldn't have as much uptake without a functional data access solution -- so they produced and bundled the original Type 1 JDBC-ODBC Bridge Driver, sun.jdbc.odbc.JdbcOdbcDriver, but from the very beginning, they warned that users "should use the JDBC-ODBC Bridge only for experimental prototyping or when you have no other driver available." That bundled JDBC-ODBC Bridge was (and always remained) single-threaded, and though it received some other updates along the way, it only ever supported a subset of JDBC 2.0 and later. Sun (and later Oracle) recommended that users employ "a pure Java JDBC technology-enabled driver, type 3 or 4, in order to get all of the benefits of the Java programming language and the JDBC API." Where does OpenLink Software come in? 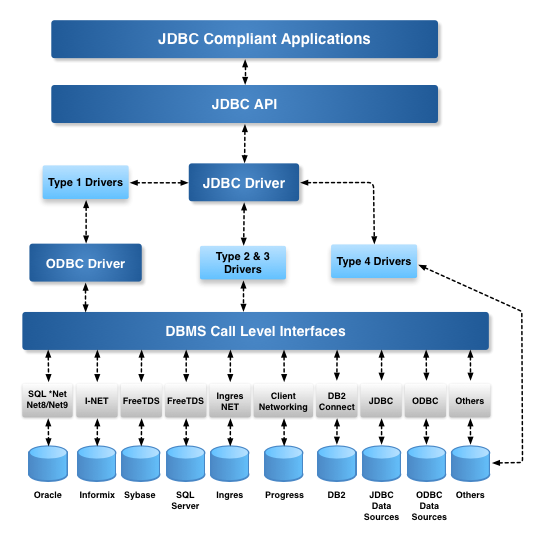 Even in the early days of JDBC, we saw that there would not always be an available JDBC driver for a given target data source -- but the numbers of ODBC drivers were rapidly increasing, supporting every major and many minor DBMS and other data sources. We saw a need for an enterprise-grade, non-experimental Bridge solution, with full support for the JDBC API. We delivered this first as our Type 3 Multi-Tier solution, bridging from JDBC in one environment (typically a UNIX-like OS) to ODBC in another (most often, Microsoft Windows). Soon afterward, we released our first Type 1 Single-Tier solution, first for Windows, but quickly also supporting Linux, Mac OS X, Solaris, AIX, HP-UX, and other UNIX-like OS, through our own iODBC driver manager -- which was itself helping to expand the ODBC ecosystem far beyond its birthplace on Windows. Why is Java 8 so special? Any Java users or applications relying on ODBC connections and also needing the security and other improvements found in Java 8 are left high and dry... Or would be, but for OpenLink Software. Our JDBC-to-ODBC Bridge, in both Type 1 and Type 3 forms, has been available and regularly updated since its original release for JDBC 1. Fully multi-threaded since Java Runtime Environments (JREs) could handle such, we have also kept pace with the JDBC API -- now at JDBC 4.2, in 2015's Java 8 a/k/a JDK/JVM/JRE 1.8 -- and maintained compatibility with the also-evolving ODBC API, now at 3.8. Especially important for the modern world, our solutions support both 64-bit and 32-bit environments, including both 64-bit JVMs and ODBC drivers, and our Type 3 solutions can even bridge between these, whether you have a 64-bit JVM and need to connect to a 32-bit ODBC driver, or you have a 32-bit JVM and need to connect to a 64-bit ODBC driver. As always, our solutions are available for immediate download, with a free two-week trial license provided alongside. We encourage pre-purchase installation, configuration, and testing, with support provided through our web-based Support Forums and even free up-and-running Support Cases. Once you've confirmed the driver works for you, entry level and special offer licenses may be purchased online or through our Sales Team; these as well as custom license configurations or partnership (IBP, ISV, VAR, OEM, etc.) arrangements are always available by direct contact.